Men's Tan Through shirts - Polos to t-shirts to tank shirts! Whether you're playing golf or tennis, boating or just sightseeing, a COOLTAN sport shirt lets you get a safe, natural tan without unsightly lines at the neck and arms. 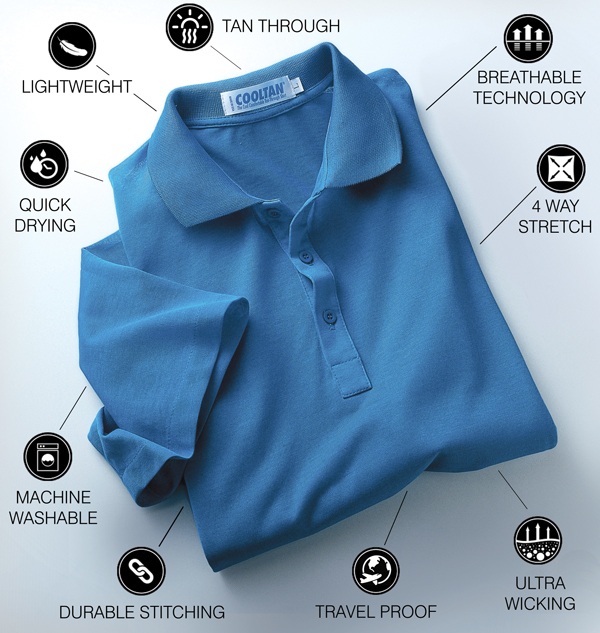 The light-weight fabric in COOLTAN shirts not only lets you tan, but keeps you amazingly cool and dry as well! Air flows right through the fabric, so moisture evaporates twice as fast as it does with other shirts. You stay cooler and drier even on hot summer days. Microsol fabric is specially woven to allow sunlight to pass through while providing SPF 6-10 sunscreen protection. Since the weave is so light, air flows freely through the fabric, while rapid moisture evaporation wicks away body moisture, keeping you wonderfully cool and dry. It's the perfect shirt for traveling!